Folgers Filter Pack Office Coffee. 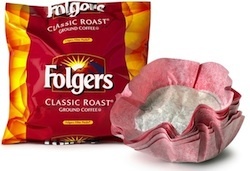 Folgers is now packaged in ultra convenient filter packs. The filters are even "color coded" (red for regular, green for decaf) for ease of use. Great Coffee. No more spills or mess, easy to use, easier to enjoy!! Each case contains 4 - 10 count packages for a total of 40 full pots of fresh Folgers Coffee.